proposed Site C dam threatens to obliterate that heritage. 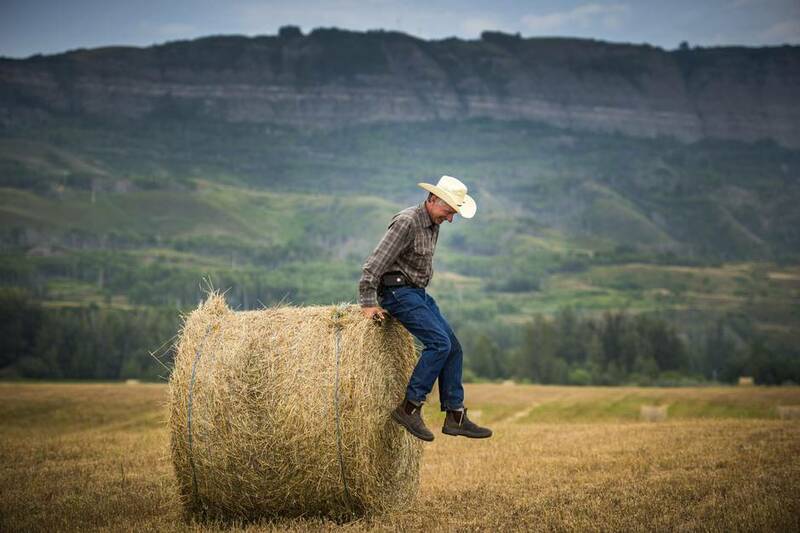 Gerry Attachie stood beside the small, unmarked grave that was overgrown with Saskatoon berry shrubs and looked out over the Peace River Valley. 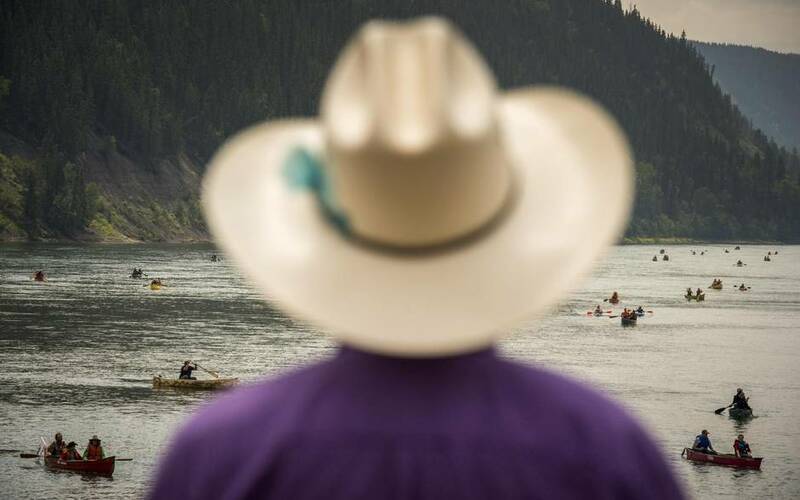 He knew that if BC Hydro’s $9-billion Site C dam is built one day, the water level would rise to cover Bear Flats below, long a sacred gathering place for the Dane-zaa people. It would climb up to the top of the knoll where he was gathered with a small group of elders and honoured guests, and would flood the grave of his grandmother. “There are lots of graves all over,” he said of the land that would be inundated by the planned reservoir. 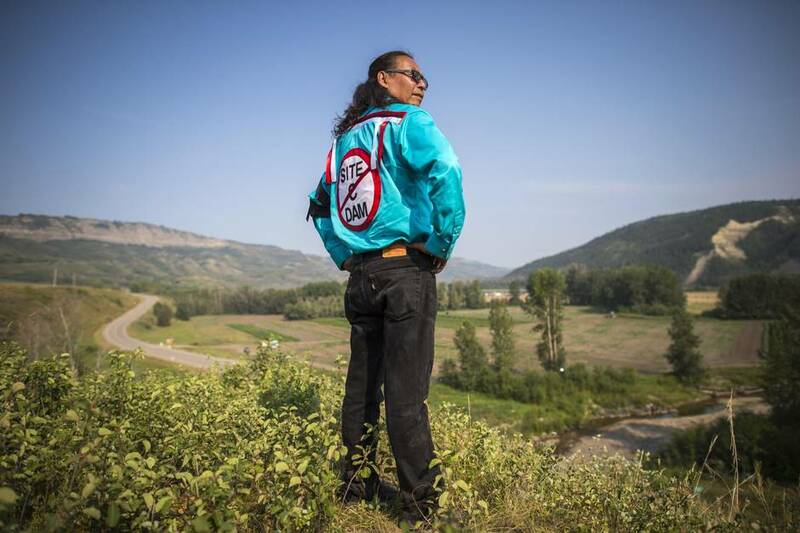 The threatened inundation of graves and other culturally important sites has taken on a new sense of urgency with First Nations in the Peace River Valley since the government issued authorizations in July allowing BC Hydro to start construction of the massive project. Preliminary work, including construction of an $8-million access road, is expected to begin soon, and BC Hydro has been holding job fairs this summer in small northern communities. First Nations are divided on the project, with some signing impact benefit agreements with BC Hydro, while others launching court challenges to stop the dam. One point all parties agree on: if the valley is flooded, the cultural and historical loss will be unavoidable and significant. BC Hydro has promised to mitigate damage wherever possible, but the solutions aren’t simple. Prior to contact, aboriginal groups placed the dead in trees or on raised platforms, leaving no permanent grave markings. And those buried in historic times were often interred not in church graveyards, but out on the land in places considered sacred, with their locations kept secret by families. In an archeological survey, BC Hydro has identified five graves, but its search has been limited because First Nations declined to point to sites. An unknown number of burial sites exist in the flood zone, including at least one mass grave. But the graves certainly exist, as the one at Mr. Attachie’s feet attested. Deeply cut into the earth, and long overgrown, it was missed in BC Hydro’s extensive archeological survey of the valley. On the slopes near where Mr. Attachie stood is a grave holding the remains of his grandfather, one of seven chiefs who in 1899 signed Treaty 8, which guaranteed native people could continue their traditional way of life. Mr. Attachie asked the elders to hold hands and then they all bowed their heads. Shortly after Mr. Attachie left his grandmother’s grave, George Desjarlais arrived, clambering up a steep bank from Highway 29, which passes below. The spiritual leader had seen the gathering atop the knoll and wanted to mark the grave with prayer flags. 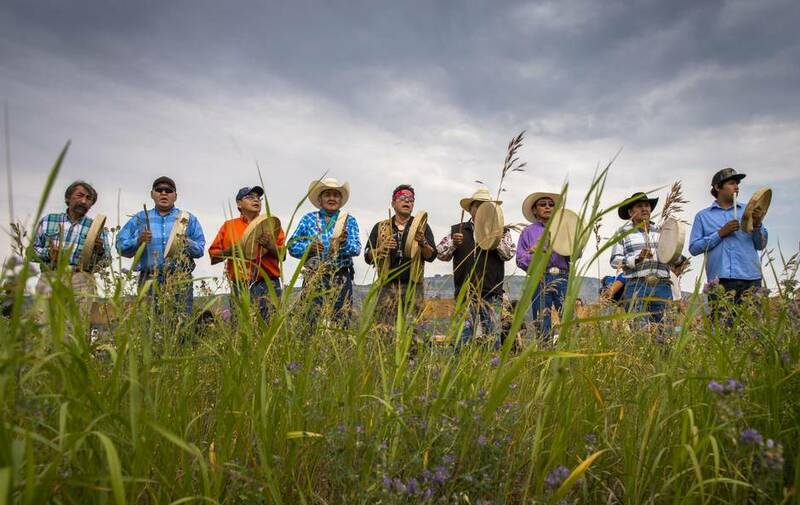 Among the Dane-zaa, the location of grave sites aren’t shared outside families, but with the Site C project about to begin, people are being urged to volunteer that information so the graves can be blessed with prayer flags, which are thought to offer protection. “Grave sites like this are hallowed ground and should not be destroyed,” Mr. Desjarlais said. Karen Aird, an archeologist and member of the Salteau First Nation, said it isn’t known how many unmarked native graves lie in the flood zone of the Site C dam, but it could be thousands. BC Hydro has identified more than 300 culturally important locations in the flood zone, including camp sites and gathering places, Ms. Aird said, but the survey is incomplete because First Nations wouldn’t divulge the locations of many sacred places. BC Hydro was unable to provide a spokesperson to answer questions, but offered links to filings made in the EIS. They show the utililty did extensive archeological research, but it’s work was handicapped by a lack of detailed information from First Nations. “Ceremonial and sacred areas, medicinal plant gathering sites, burial sites, and other places reportedly of spiritual or cultural use importance were described to BC Hydro, but not always with geographic precision … such that the location or nature of the site is unidentified,” BC Hydro states. It turned up everything from dinosaur teeth to ancient stone tools and old fur trading posts. In all, it identified 173 paleontological sites, 251 archeological sites and 42 historical sites. Not far from where the dam is to be built lies a small cave that illustrates how archeologically rich the area is. Leading the way to the Charlie Lake cave, which is a few kilometres outside the flood zone, Ms. Aird said digs by Simon Fraser University unearthed what may be the oldest bead yet found in North America – dating back 10,700 years – human remains and signs of religious ritual. Near the cave, archeologists found burned human remains 8,000 years old and two raven skeletons. “Ravens are sacred animals [that] take care of the transportation of the spirit to the underworld,” she said. Also at Charlie Lake cave were 10,500-year-old stone implements that have been tied to Paleo-Indian sites in Montana, and ancient bison bones from even farther south. The find provides the first proof that early humans moved from south to north, not just in the opposite direction, which Ms. Aird said makes Charlie Lake cave one of the most important archeological sites in North America. She said the valley is so rich in artifacts “it’s just a giant cultural landscape,” but it has barely been touched by scientific research. Much of the work that’s been done has been funded by industry – both BC Hydro and the booming oil and gas sector – because archeological surveys are required before land is disturbed. Ms. Aird welcomes the research, but says it is directed by the needs of industry, not science, and nobody is putting the finds into broader context. How does the Charlie Lake cave relate to the ancient sites within the flood zone? No one knows and once the area is flooded important sites that might explain that link could be lost. Stopping at the offices of Archer CRM Partnership, an archeological consulting firm in Fort St. John, Ms. Aird asks Mike Elvidge, field director for the company, if she can see his latest finds. He pulls out dozens of bags containing stone spear points, arrowheads, broken knife blades and razor-sharp pieces of obsidian, a glass-like stone that was a valuable trade item among early peoples. Finding stuff such as that is routine for the Archer team. “We have sites from 12,000 years to 250 years ago and there doesn’t seem to be any gap [when people weren’t living in the region],” Mr. Elvidge said. He said the petroleum industry, for which Archer does a lot of work, is responsive when research shows a development threatens a culturally important site. A gas company recently realigned a well site to avoid an area after Archer consultants turned up artifacts. Pipeline and road routes have also been altered. But BC Hydro’s Site C project is on such a massive scale, flooding more than 5,000 hectares of land, that it can’t help but destroy important cultural sites. Among the sites to be flooded will be Rocky Mountain Fort, the oldest fur trade post in B.C. Alexander Mackenzie identified the site when he first paddled up the Peace in 1793, and the following year a fort was established near the mouth of the Moberly River, just upstream from where the Site C dam is to be built. Mike Meirs, a welder and member of the River Rats, a boating club, scanned the shoreline as he searched for the old fort. There was no sign of any structures, but he spotted flagging tape tied to a willow. That is how B.C.’s 221-year-old trading post is marked. Tramping through the bush, Mr. Meirs located the site, now just a few depressions in the ground, and shook his head. BC Hydro has funded archeological research at the old fort site and has proposed mitigation measures, “including relocation, systematic data recovery, capping, monitoring, and compensation-in-kind,” states the joint review panel report. Recovered artifacts would be placed with the Fort St. John Museum. The panel concluded, however, that such measures wouldn’t fully mitigate the damage. “The Panel determines that the loss of the cultural places as a result of inundation, for aboriginal and non-aboriginal people, to be of high magnitude and permanent duration and be irreversible … the existing historically valuable cultural sites would be permanently lost,” the report states. Although BC Hydro has cleared all regulatory hurdles, many people remain convinced the project will be halted. “I am optimistic this project will never get built,” said Ken Boon, a farmer, as he stood in one of his hay fields on the banks of the river. He and his neighbours often find prehistoric arrow and spear points while working the land, which will be drowned if the dam goes ahead. “This will be under 100 feet of water,” he said looking down at the rich soil beneath his boots. Mr. Boon thinks legal challenges and “the court of public opinion” will stop the project. B.C. Regional Chief Shane Gottfriedson, of the Assembly of First Nations, said aboriginal people aren’t about to give up their opposition. 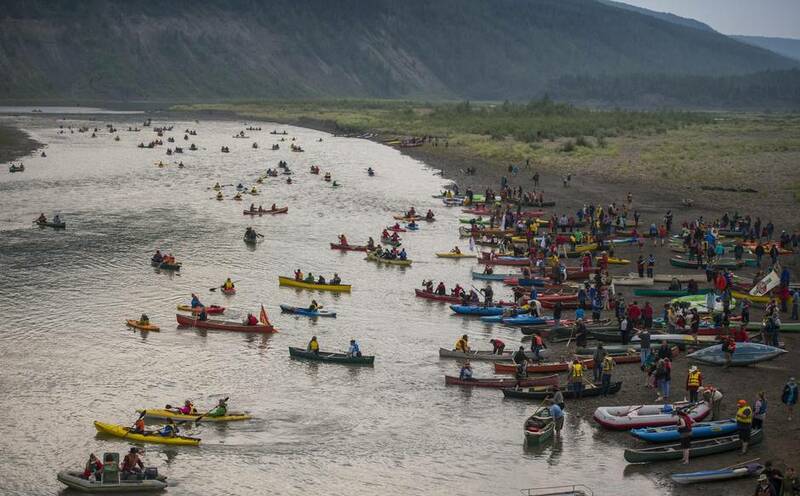 “When you are born First Nations you are born to fight,” he said, speaking on the banks of the river to about 300 people at a recent Paddle for the Peace event. Mr. Gottfriedson reminded the crowd of the Oka crisis of 1990, when police, the army and Mowhawk protesters clashed in Quebec over a proposed development on a native burial site. “I see another uprising happening right here,” he said. After the native leaders finished speaking the crowd launched about 150 canoes and kayaks and floated quietly off. 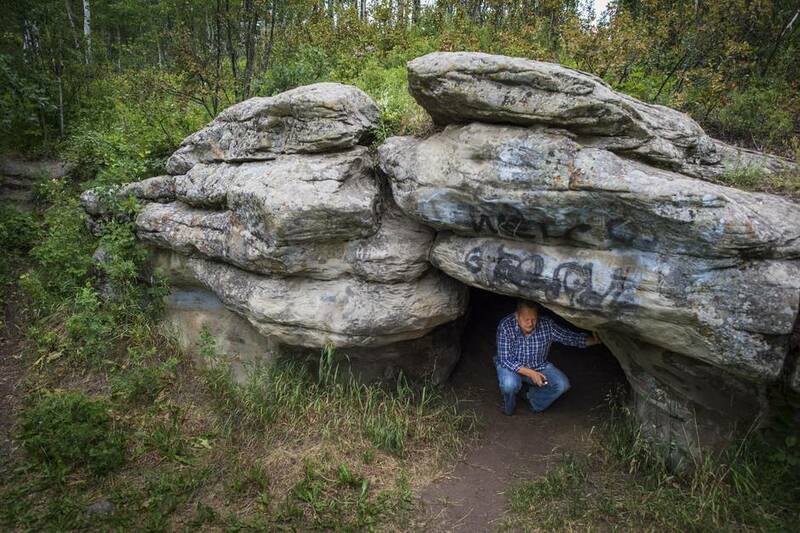 Hours later they pulled out at Bear Flats, where elders said the nearby forest hid many graves. Editor's note: An earlier version of this article incorrectly stated that an archeologically significant cave was located in the dam's flood zone. This has been corrected.